For the fifth in the series of Blades Heroes Interviews I am delighted to have spoken with wing wizard Ian Bryson. The Scotsman was a key player in United’s back to back promotions as they eventually returned to the top flight in 1990. If the stats were recorded in those days it would show he provided numerous assists alongside 44 goals in 177 starts in all competitions for United. Not bad for a player, who up to the age of 25 was playing part time in Scotland. He we went on to captain Preston as they started their return from the football doldrums and when we spoke we also talked of his spells at Barnsley, Rochdale and of course Kilmarnock, where it all started. As quietly spoken as I remember from his playing days, he retains a strong Scottish brogue, despite having now spent nearly half of his life south of the border. Growing up in Scotland did you have any great hopes of a football career? I grew up on my Mum and Dad's dairy farm in Ayrshire. I was playing junior football from under 12 through to under-18 for Ayr United Boys team. I was playing alongside Alan McInally. In those days it was a case of you would be taken on by the club you were at as a pro at 18 or released. Unfortunately, Ayr didn't want me so I continued to work on my parents' farm and played for Hurlford United; a club in the Scottish junior leagues. I'd been with Hurlford for about eight weeks when Kilmarnock (then a Scottish Division 1 side) approached me about a trial. I went for the trial on the Thursday, had a really good trial match, and signed for manager Jim Clunie on the Friday. I continued to work on the farm, full-time dairy farmer, and part-time footballer. It really hit home, the step up I had made when I made my debut in a benefit match a month later. It was against Celtic, which was a big thing for me. I was on the left wing and up against Danny McGrain; A Scottish international full back, a Celtic legend and an imposing figure. Did it take you long to make your league debut? My full league debut came in the following January against Hamilton Academicals and I scored a penalty that day. It was a quick transition from playing at Hurlford to starting in the Kilmarnock first team and I was still only 18. Scoring a penalty on league debut for Killie, a lot of trust in a young player, were you playing up front that day? You spent seven seasons with Kilmarnock and had a decent scoring record for a wide player (38 goals from 156 appearances), did you have any opportunities to move elsewhere and how did the United interest come about? I enjoyed it at Kilmarnock, but I thought my time had passed as I was now in my mid-20's. There were times I was linked with SPL clubs, Dundee United were one I remember amongst others, but nothing happened. I was happy enough doing what I was doing then at the start of pre-season in 1988 Eddie Morrison, then Killie manager, asked me if I fancied going on trial with Sheffield United and joining them on a pre-season tour in Sweden. I didn't have to think too much about that, it wasn't a difficult decision. Off I went with United for two weeks. 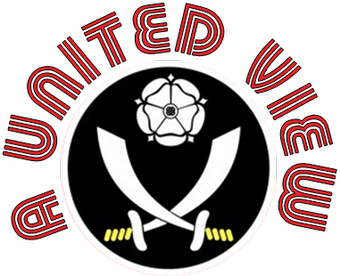 Even though the Blades had just been relegated to Division Three? Yes but even though they had been relegated it was a chance to play in England at a big club, with an impressive ground. Was it a daunting prospect joining up with United pre-season in Sweden? Yes it was daunting but it was a chance to show that I had what it took to do something I had dreamed of since I was young - become a full time professional footballer. Did you feel that you had done enough to earn a contract? I did feel I had done enough but I still wasn't a hundred percent sure in fact I asked Frenchie (Derek French - United's physio) for a shirt and pair of shorts as a memento in case it didn't work out! On my return from the tour, Dave Bassett said he wanted to sign me and I left it to the clubs to sort out the deal. It wasn't much of a decision for me, as I was still working on the farm whilst playing for Kilmarnock, the chance to be a full time footballer was a fantastic opportunity for me. It was a huge change for me, like learning football over again to a certain degree. I am not dismissing the standard of Scottish football at that time, but I was coming to full-time football and doing it as my living. I was moving to a big city, a new environment, different players and a different style of football. Harry was renowned for long-ball or being direct so I wasn't used to that, but it was similar for a lot of players working with Dave. I think it helped that there were quite a few new lads around, Harry was re-building after relegation and we all bonded, adapted and learned together. That helped us do so well and played a big part in our two successive promotions. Much is made of that team spirit. What was it about Dave Bassett that engendered such a spirit and led to such success? Having been relegated the year before there is usually a massive transition which doesn't necessary mean immediate success. Dave Bassett deserves a huge amount of credit for what we achieved in that period. He and his scouts looked around and identified the players, most of whom were not that well known at the time; Brian Deane at Doncaster, Alan Roberts at Darlington, he had already brought Tony Agana in from Watford and we all seemed to fit together and get on well. These weren't well known players at the time. We all seemed to get on really well and that's half the battle. There were no egos or ‘Big Time Charlies’, there were few "personalities" although the ex-Wimbledon lads like Wally (Downes) and Francis (Joseph) helped in the dressing room. We built a great team spirit, made a great start on the pitch and carried it on, but it's all down to Dave Bassett. It was a major change for you coming to United, change of club, lifestyle, environment; a complete uprooting your life and family. How hard was it to deal with? As well as that team bonding and welcome what also helped me settle was the start I made at the club. In our first home game against Bristol Rovers I scored two goals in a 4-2 win and picked up Man of the Match. It was a fantastic start, home debut, two goals, man of the match and as a team we played really well. I then scored two in our third home league game when we beat Northampton Town 4-0. The fans took to me, they were superb, and that made things easier for me. What are your main memories of that first season and promotion from Division Three? Those two games aside, I don't remember too many individual games from that first promotion season. Apart from that final game at Wolves where we got the point needed to seal promotion. It is sort of the same with the following season as well. Clearly, the promotion clincher at Leicester stands out, that was the one that mattered. It was an amazing day. Every goal was followed by the fans invading the pitch and we were ushering them off. I really feared that the match might be abandoned! But to come off the pitch and find out that as well as going up Wednesday were coming down, it was an unbelievable day; you don't get moments like that often. The whole season was just meant to be really. The win at Leicester in May 1990 meant that United had clinched promotion to the top flight (then still Division One) returning after a 14 year absence. What always stood out for me and many other Blades fans was your work-rate in wide areas both attacking and defensively, and also your ability to find the back of the net as well regularly, as well as setting goals up. My favourite ball to play was winger to winger and quite a few goals came from that ball for both me and the team. Really wingers should score more goals these days. Although I played on the left, I was predominantly right footed which gave me plenty of options when it came to crossing and shooting. I could stay wide or cut inside and usually guarantee I could get a cross in. Obviously, United played with great target men, like Brian Deane and Tony Agana in the middle which is a dream for a wide player. My job was to put as many crosses in as possible, the more times you get the ball into the box, the more opportunities you have to score. Dave used to measure my performance by the number of balls I played in during the game. He used to tell me after whether I had put enough crosses in. I'd say we were direct, but that isn't to be negative, we were not direct in the John Beck sense. We tried to get the ball from the back to the front players quickly as we knew there we had the pace and trickery to cause the opposition problems. When we have reunions and we look back at the videos of some of the goals we scored from wide positions were really good. We got goals from all over the pitch and we had quality up front, I mean Brian went on to play for England. In Part 2 we talk about Ian and his family’s role in the BBC ‘United‘ documentary series, top level football with United, Wembley sadness and his eventual departure from Bramall Lane. Greetings from Schaffhausen, NE Switzerland. I doubt there's a better footballing read throughout this country (apologies to SwissRamble).